Meteorites from Mars found on Earth have traces of methane, adding weight to the idea that life could live off methane on the Red Planet, scientists say. But the methane detection alone is not proof that life exists on Mars now or in the past, they add. Methane, a potential sign of primitive life, has been found in meteorites from Mars, adding weight to the idea that life could live off methane on the Red Planet, researchers say. This discovery is not evidence that life exists, or has ever existed, on Mars, the researchers cautioned. Still, methane "is an ingredient that could potentially support microbial activity in the Red Planet," study lead author Nigel Blamey, a geochemist at Brock University in St. Catharines, Ontario, Canada, told Space.com. Much of the methane in Earth's atmosphere is produced by life, such as cattle digesting food. However, there are ways to produce methane without life, such as volcanic activity. 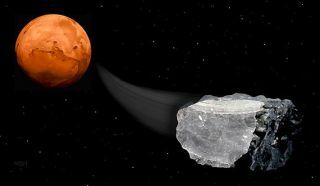 To shed light on the nature of the methane on Mars, Blamey and his colleagues analyzed rocks blasted off Mars by cosmic impacts that subsequently crash-landed on Earth as meteorites. About 220 pounds (100 kilograms) of Martian meteorites have been found on Earth. The scientists focused on six meteorites from Mars that serve as examples of volcanic rocks there, collecting samples about one-quarter of a gram from each — a little bigger than a 1-carat diamond. All the samples were taken from the interiors of the meteorites, to avoid terrestrial contamination. The researchers found that all six released methane and other gases when crushed, probably from small pockets inside. "The biggest surprise was how large the methane signals were," Blamey said. Chemical reactions between volcanic rocks on Mars and the Martian environment could release methane. Although the dry thin air of Mars makes its surface hostile to life, the researchers suggest the Red Planet is probably more habitable under its surface. They noted that if methane is available underground on Mars, microbes could live off it, just as some bacteria do in extreme environments on Earth. "We have not found life, but we have found methane that could potentially support microbes in the subsurface," Blamey said. Blamey now hopes to analyze more Martian meteorites. He and his colleagues detailed their findings online today (June 16) in the journal Nature Communications.